Education Secretary Rebecca Holcombe talks to the Senate Education Committee on Tuesday as Sen. Chris Bray (D-Addison) looks on. A Vermont Senate panel on Tuesday dealt Gov. Phil Scott’s budget plan its first semiofficial blow when it voted 6-0 against moving school spending votes from March to May this year. The lopsided loss in the Senate Education Committee straw poll was made even worse for Scott because an ally, a Senate sponsor of the proposal, voted against the move. Four Democrats on the committee readily said no. The two Republicans who joined were more reticent. “Regrettably, no,” Sen. Joe Benning (R-Caledonia) said as he voted. Then it was down to Sen. Kevin Mullin (R-Rutland), one of three sponsors of the Senate bill that supports Scott’s budget proposal. “With even more regret, no,” he said. As part of a 2018 state budget plan he announced a week ago, Scott proposed requiring school boards to hold their spending at this year’s levels. He asked lawmakers to move school budget votes to May to give them time to respond. He would also mandate that teachers pay at least 20 percent of their health care premiums. He would use some of the savings to increase funding for child care programs and higher education. The Senate Education Committee vote Tuesday was a way to take the pulse of the panel on whether budget votes should be moved to May 23. Committee chair Phil Baruth (D/P-Chittenden) said the timing was just too rushed, as the majority of school boards have already signed off on budgets, which have to be published by Friday. He said senators have received a barrage of calls and emails from school officials asking them not to change the process so suddenly. Ironically, Mullin asked Baruth why he rushed Tuesday’s committee vote. “I don’t know about the fairness of taking a straw poll,” Mullin said. “I would say it was forced on us,” Baruth responded, noting that the governor’s plan depended on quick action by the legislature to adjust school budget vote deadlines. Baruth said he’d be willing to have the committee devote “a considerable amount of time” debating other parts of Scott’s proposal, such as shifting funding from the K-12 school system to child care and higher education. After the vote, Scott’s spokeswoman Rebecca Kelley said in a written statement that the governor was disappointed in how quickly the committee acted. “We hope and expect these proposals will be fully considered by the appropriate legislative committees. At this point, that has not happened,” Kelley said. She suggested that there’s still a chance in the House, where a bill was introduced Tuesday. That bill, however, deals only with moving school budget votes to May — not Scott’s full education funding plan. Before voting Tuesday, the committee queried Education Secretary Rebecca Holcombe about the governor’s proposal. 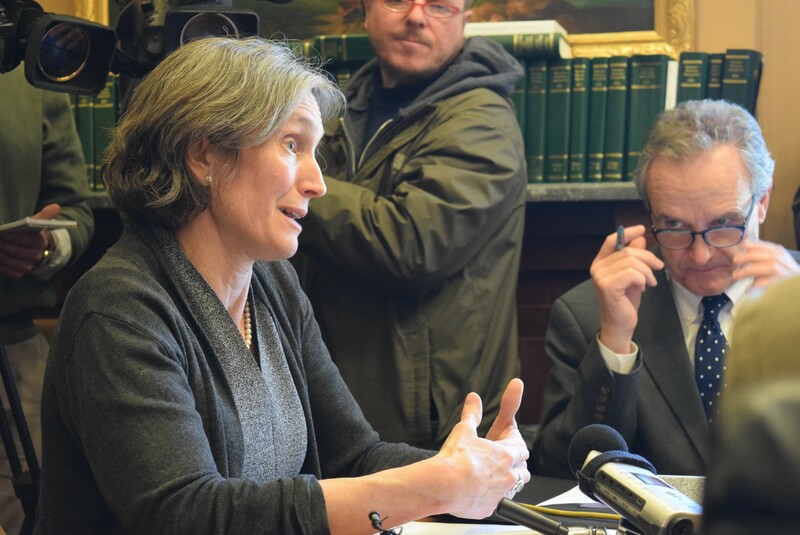 Holcombe is a former governor Peter Shumlin appointee who has applied to keep the job under Scott. The governor is expected to make a pick for the post by March. Scott told Seven Days on Friday that Holcombe didn’t help craft his budget proposal. She is still in the running for the secretary job, he said. In committee, Holcombe deftly avoided directly answering questions about Scott’s plan. Sen. Chris Bray (D-Addison) asked her if requiring districts to level-fund budgets would create confusion for those working on legislative-mandated consolidation plans. She replied, “Our boards understand that we have pressing financial concerns.” Bray did not press her further. Holcombe did later acknowledge that Scott’s plan represented “a substantial shift” in the way school budgets are crafted.